A dirt road leads from the foreground of the photo to the background. To the left of the road there is wood-frame building with porches on both levels. Next to that building there appears to be a few farm buildings and another wood-framed dwelling. On the left of the road there is wooden fencing, utility poles and deciduous trees. In the background there is a forested mountain. Phil writes on 2012-11-28: This photo looks east down Meeting House Hill, across the RR tracks to the river, the black dot at the end of the road is the entrance to the covered bridge. 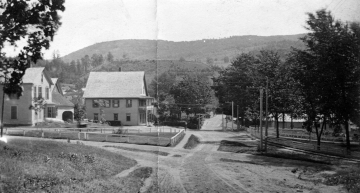 The large building in the center is the General Store and Post Office, the building the to left is half of the Passumpsic Hotel (now a 2-apt building); to its right, partially hidden, is the blacksmith shop. The road crossing in the foreground is now US Rte #5.